“Going Green” in the building trades means different things to different people. Some builders take it to mean giving products a second life, reusing everything from windows to doors to 2x4s. Others cite automating processes, often in a factory setting, then piecing homes together on site. Integrating technology for so-called “smart homes” so as to use less energy is another application. Nathan Griswold takes the term literally. Griswold’s firm Inhabitect creates living roofs, with plantings of all sorts, from grasses to succulents to vegetables. Griswold, the president, CEO and founder of the company, has been involved in live roof construction for 14 years and is one of the first individuals to receive Green Roof Professional (GRP) accreditation from Green Roofs for Healthy Cities. 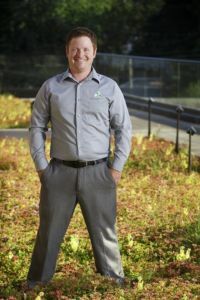 Before starting Inhabitect, he served as the senior garden roof technical sales coordinator for American Hydrotech from 2005–2013—one of the world’s largest waterproofing and green roof manufacturers. “There are a lot of reasons people are doing this,” he continues, adding that living roofs offer a “triple bottom line” of economic, environmental and social factors. On the economic side, Griswold says the living roofs help equalize a building’s temperature, particularly in the summer. That means there will be a decrease in the use of air conditioning and subsequent lowered costs for electricity. That up-front savings is enhanced by the fact it makes the building more valuable, generating a higher sales price when it’s sold. Environmentally, living roofs help manage stormwater, since the rain soaks into the soil rather than running off into streets or sewers. Obviously good for Mother Earth, it also translates to cost savings as the expensive stormwater systems mandated by government regulations can be much smaller or eliminated altogether. As the buildings require less energy (as mentioned above), they also use less fossil fuel. Lastly, living roofs potentially increase biodiversity, depending on which plants are used. Social benefits are probably the most difficult to quantify, but Griswold says living roofs improve the community’s health and well-being because people are naturally more upbeat in the presence of plants compared with being indoors around artificial light. At Cherry Capital Foods, workers can enjoy their lunch outdoors and a respite from work. At Munson, patients can get a breath of fresh air and take their mind off their illnesses. The roofs serve as outdoor patios and gathering spaces. “It (being around vegetative roofs) reduces absenteeism and increases productivity. When people see the plants they want to know more, to be a part of it,” Griswold says. While the price of living roofs is higher than shingles or metal roofs, selling customers on the fact those costs are recovered over time isn’t Griswold’s biggest challenge. It’s selling people on the idea of living roofs. Builders and homeowners are one thing, but often Griswold has to educate architects and engineers, as well as government officials. The various construction standards in place typically do not include specs for living roofs. Those not acquainted with living roofs may question their longevity and effectiveness. The roofs are installed over a high-quality waterproof membrane, thus eliminating any possibility of leakage. And if done correctly, Griswold says it should increase the lifespan of your waterproofing, not interfere with its performance. Griswold’s expertise is noted both locally and worldwide. He was named Environmentalist of the Year by the Northern Michigan Environmental Action Council in 2014. This year he attended the World Green Infrastructure Congress, a world conference on green building, in Bogota, Colombia, where he spoke on policy implementation. He also met with other experts in the field and is looking at ways to diversify his business, moving his greening efforts to other areas, even indoors. He’s investigating living vertical walls, both interior and exterior, which improve indoor air quality and offer the opportunity to cultivate an indoor herb garden in a kitchen or restaurant, Griswold says. Another direction he’s looking is at permeable pavement, which includes reusing items such as crushed tires. “It allows water to filter through it, so there’s no runoff. It’s like a big Rice Krispie treat,” he says with a laugh.